Wow this turned out to be a great ride. I want to thank Scott and Tom for getting me off my duff to get out on this adventure. Our inmates for this trip were Tom, from Prescott, who is riding a Honda XR650L, Bill on a Honda 650 XRR, Kim who is riding a Kawasaki 250, Scott on a Yamaha 250WRX, and myself on a Honda XR650L. All of us are moderate to excellent riders (2 of us, Tom and I, raced AMA District 37 desert series), the youngest is pushing 56 (Scott), & Tom broke 70 some time back. 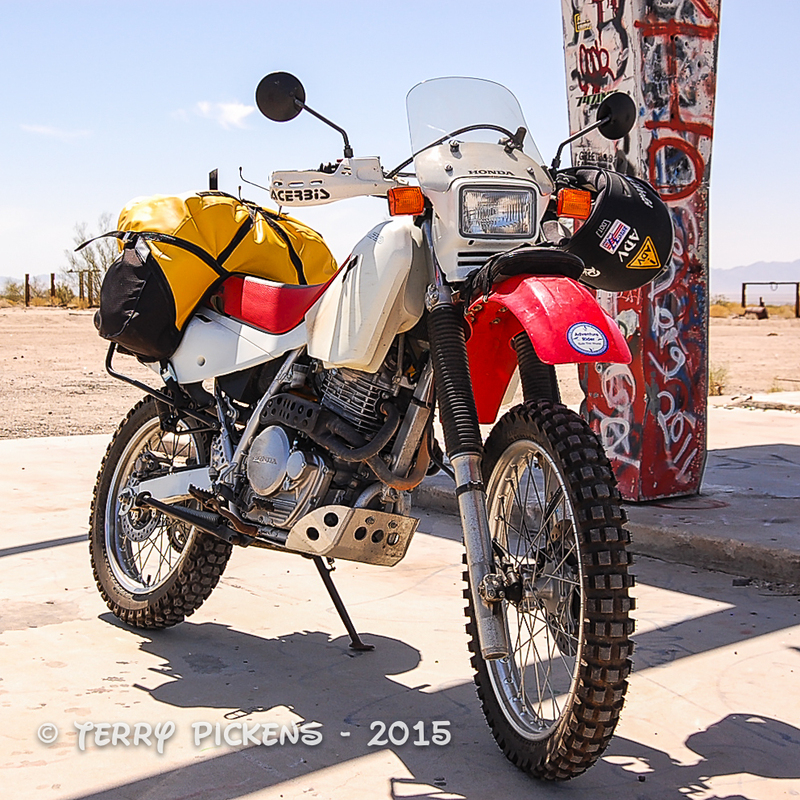 I rode from Orange County, CA, yes on the XRL, to Vidal Junction, CA where I was to meet Tom and continue off road as much as possible to Prescott, AZ. My ride started early at 4:30 AM and headed over the mountains on Ortega Highway between San Juan Capistrano and Lake Elsinore. It was a cold foggy ride over Ortega with visibility probably at about 50 feet at times. Soaking wet I arrived in Elsinore and stopped at the first place I could get something to eat and go inside to get warm, OH BOY Mac D’s. After breakfast it was still foggy as I followed 2 lane roads to Beaumont where I had to jump on Interstate 10 and slab it till I reached 2 lane Highway 62 thru Joshua Tree 25 miles later. Leaving Joshua Tree I was on a long straight desert highway till I reached Vidal Junction where I was to meet Tom, have lunch and fill my gas tank. After a short break and a quick pre-made gas station sandwich (YUK) we jumped on Highway 95 north for a run to a dirt powerline road as it winded thru the mountains to drop us in Parker, AZ right at the Parker Dam. Again we stopped for a short snack for us and to fill the hungry bikes then continued NE toward Prescott on dirt and gravel roads till we arrived at Highway 93. It was getting late in the day so we turned on Hwy 93 to slab it to Tom’s house in Prescott instead of finishing up the off-road trails Tom had scouted for us. Arriving about 5:30 at Tom’s house we had a fun ride even though it was a long day at 450 plus miles on a stock Honda seat for me. Bill was driving in from Silver Lakes with his bike in his truck and when he got there we enjoyed a lovely dinner prepared by Tom’s wife, Paula. The next day Tom, Bill and I got up before the sun to a fine breakfast that was prepared by Paula to fill our stomachs for long journey today. We left Prescott to meet up with Scott and Kim who were coming from Sedona. 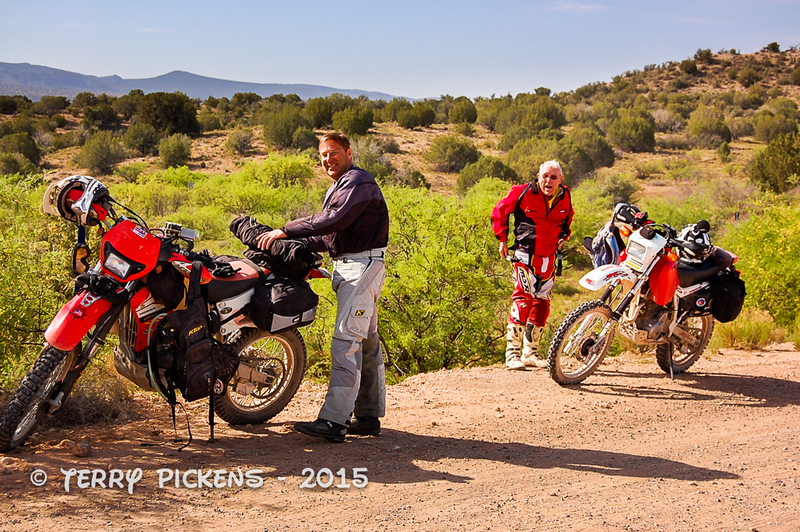 Between Scott and Tom they prepared a great ride through the national forests and the Navaho Nation until we were to end at the Grand Canyon. I want to thank Scott for the information on day 2. It was taken from a earlier report he had done about the ride. Tom, Bill, & I ride over near Sedona on mostly dirt roads and trails where we met up with Scott and Kim then headed up dirt Stoneman Lake Road to go through the National Forest, pass Mormon Lake and Wynona Ranch up to Flagstaff. Up near Mormon Lake, it is near 7,000-foot elevation and is nice & cool in the pines. Wynona Ranch Road is where the boulders begin, & the road gets interesting. 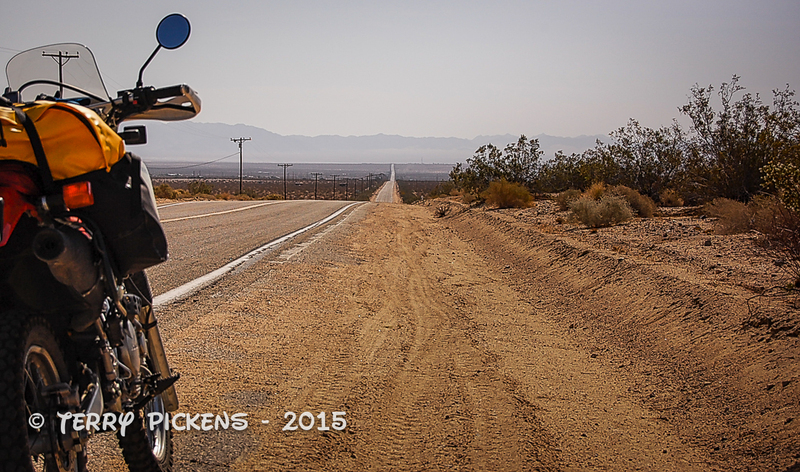 We had a few gnarly spots on the way, but nothing really bad for the motorcycles we are on. Wynona Ranch Road is a great day ride that Tom and Scott like to take at other times during the year. It makes a great inclusion in the Grand Canyon Ride as it’s not too long, or rugged, but is challenging, scenic and on the way to Grand Falls on the Navaho Nation. From Flagstaff on to the Grand Canyon you must pay a fee for a pass from the Navaho Nation to cross the Nation off-road, camp or hike. We fill up the bikes and grab a snack outside of Flagstaff, then continued north up Leupp Road toward Grand Falls (aka, Chocolate Falls). There would be no falls today as the water is low, but this made for an easy crossing of the river. The road to Grand Falls is a sandy, wide, washboard, dusty and fast. Tom passes all of us to get to the falls first. We ford the river and took another short snack/lunch break here enjoying what water is flowing over the falls, then continued through sandy washes and long flat roads in the Navaho Nation to Cameron. We saw some wild horses in the distance, but since they have spring foals, they usually don’t come too close. The horses are hunted & caught for use by the Navajos and stay away from humans. Very rarely are they seen within a hundred yards of the roads and we only see them galloping up into the rocky heights. This section of the ride is one of Tom’s favorites so to suggest another route is not on the radar, he would pout for weeks according to Scott (HA, HA), and so the ride through Grand Falls is considered an essential route to the Grand Canyon. It is a fun ride, the roads are sandy and there are some dry sandy streams you have to pass through with some rocky sections thrown in to keep you alert. There were a few spots where the sand got deep or blew over the road in long heaps but if you keep your speed up they are not a problem. You very seldom see any vehicles here, but we did cross paths with an ADV Rider on a Yamaha going the other way, but neither of us stopped to chat. There are a few older hogans, and other inhabited trailers & small homes that the ranchers live in, but it is very isolated. You feel a long ways from civilization, which is just what we want. Eventually we made it to Cameron, where we would cross the Little Colorado River again, this time over a vehicle bridge. We then slabed it south to Gray Mountain, where we filled up the bikes again and connect with the Gray Mountain Truck Trail, another fantastic road going the direction we wanted. This was still on the Navajo Nation and was a very rugged road, with lots of rocky climbs, turns, dust, & more wild horses. We dropped below 6,000 ft. elevation at Cameron, but climbed again on the Gray Mountain Truck Trail to 7,000 ft. 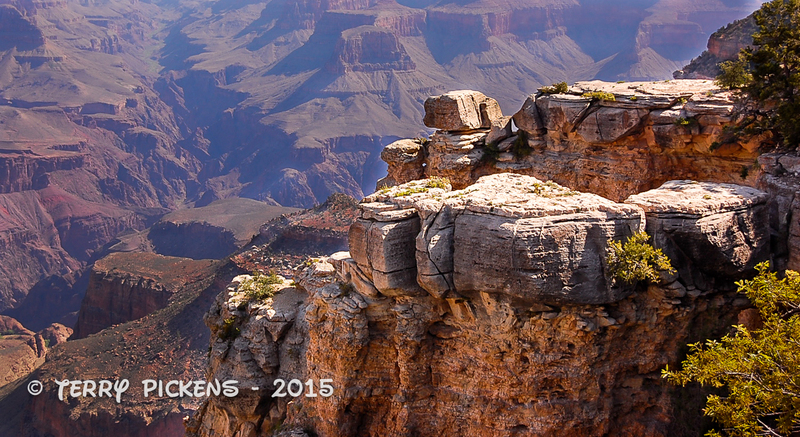 The views were fantastic, and it is still very sparsely populated. There is one ranch early on the Gray Mountain Truck Trail, but none after that. We came down the switchbacks, and proceeded down the pavement for a few miles until we came to another dirt road, a blue-gray improved gravel road that leads into the Grand Canyon National Park. We are not far our lodgings now! Going to our rooms, we clean up and go down to have a hearty dinner and watch the basketball playoffs in the pizza parlor at Maswik Lodge, our home for the next 2 nights. Bill and I were tired after another long 250+ mile day so we left early and crashed in bed while the others stayed to watch the playoffs. The next day Tom, Kim and I decided to opt out of the ride that Scott and Bill are going on. I had never been to the grand Canyon for a full day so I walked 7 miles along the Grand Canyon rim to enjoy the views and had a rest day, while Tom and Kim lounged around the lodge. 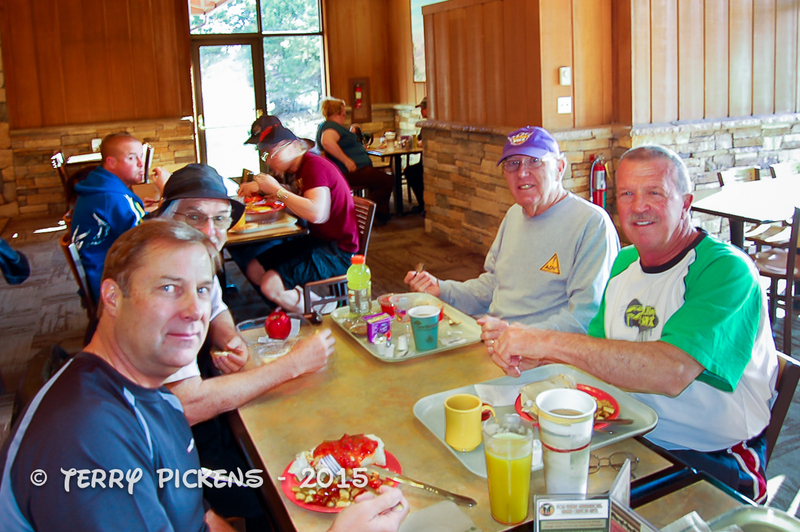 Bill, Scott, Kim, Tom and I ate breakfast at the Lodge and I left for my walk for the day about 7:30 AM. 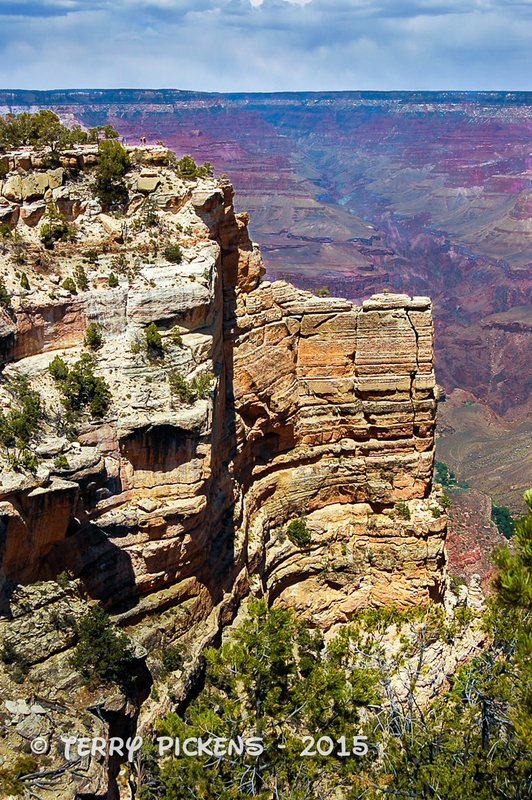 I walk the ¼ mile down to the Bright Angel Lodge and go east on the Rim Trail passing Kolb and Lookout Studio’s and go inside the Verkamp’s Visitor Center to learn a little history and geology of the Grand Canyon. I continue on the Trail of Time east till I get to the Grand Canyon National Park Headquarters and explore the small visitor center there, go into the gift shop to explore the trinkets and books and sit down for a well deserved snack break. Filling my water bladder of my camelback I continue east on the Trail of Time to Yavapai Point tram stop to catch the free tram back to the Grand Canyon Village. I stop at the grocery store there and pick up some items for lunch. Back on the tram I get off at Village Loop Road and Hermit Drive, my starting point this morning to continue my walk west along the Hermit Ranch / Rim Trail stopping to enjoy the vistas at Maricopa Point, Powell Point and Hopi Point. It is getting late so I walk back to Powell Point and sit to enjoy the sun setting. I would love to sit here and watch the sunset but it is about 6 PM and we are all to meet for dinner. With no cell service to let everyone know I would not show up I decide to jump back on the tram and hightail it back for dinner before they started to worry. We eat in the Lodge’s buffet and have a great time discussing the adventures of the day. Such a fun evening but it all must end, Tom, Scott and Kim head back to one of the rooms to watch the basketball playoffs, Bill goes down to the Visitors Center for a ranger talk and I must start packing my gear for the early start time in the morning for the long ride home. The last day for me was another long day in the saddle, and sorry no photos, as I rode from the Grand Canyon, AZ to Orange County, CA. Going down to the Buffet for a quick breakfast I left the Grand Canyon around 7AM to pull into my driveway in Orange County at about 5:15PM. I pushed the bike into the garage, got out of my dirty clothes, went upstairs to take a shower, ate a wonderful tasting chief salad and rolls made by Jodi, then was asleep by 8:30PM. Yes I am a wimp but my excuse is that I had to get up and go to work the next day and that was a long 500+ mile ride today.